After being thoroughly disappointed with Diablo III, I was nervous that Blizzard might let me down with the latest expansion of StarCraft II: Heart of the Swarm. However, after playing through the entire campaign and some multiplayer matches, I have to say that Blizzard has redeemed themselves. I was skeptical of Blizzard turning StarCraft II’s story into a trilogy, but the Zerg portion of the game offers some useful and insightful views on the Zerg’s role in the StarCraft story and sets the stage for the conclusion. With the refined gameplay, epic story, and cast of interesting characters, Heart of the Swarm is a welcome expansion to the Starcraft franchise. The single player campaign takes place some time shortly after the events of the Wings of Liberty campaign. At this point in the story, Kerrigan has been turned back to a human-ish version of her previous self, but that doesn’t last too long. During the first quarter of the Heart of the Swarm campaign Kerrigan’s memory of being the all powerful Queen of Blades has been lost, and so have her powers. After a few initial missions introducing basic gameplayGathering minerals, building a base and creating units. the campaign starts taking off when Kerrigan’s love interest, renegade captain Jim Raynor, is taken captive by Starcraft’s long time bad guy Arcturus Mengsk. This sets the entire story of Heart of the Swarm in motion sending Kerrigan on a mission to rescue Jim and to kill her arch nemesis Arcturus Mengsk. Boarding a gigantic interstellar Zerg ship, called the Leviathan, Kerrigan jumps from planet to planet, building both her powers and grasp over the scattered Zerg swarm. After a few missions a new enemy, the ultimate enemy of the Starcraft II trilogy, Amon, is revealed outlining the overall objective of destroying this ancient being in the next Starcraft II installment, Legacy of the Void. The campaign’s story sounds a quite familiar to the story of Warcraft III: An ancient evil has come back from the depths and all the races must cooperate in order to destroy it. That being said Heart of the Swarm’s beautiful cut scenes and character development separate it from being a direct rip of off Warcraft III. Blizzard outlined early that this expansion of Starcraft II would follow the trials and tribulations of Sarah Kerrigan as she regained control of the Zerg swarm and battled with being both Zerg and Human. They make Kerrigan into a really well developed character by showing both her ruthless nature to her enemies, but also showing her merciful side while letting civilians live during her invasion of the Terran capital planet. The game delivers on many levels showing Kerrigan’s inner struggle of doing whatever’s necessary in order to save the man she loves, exacting revenge on Mengsk, and also being able to customize Kerrigan into the universe’s most ultimate badass. Again taking a page out of the Warcraft III playbook, Blizzard created Kerrigan as a fully playable Hero in most of the 27 missions in this game. She comes complete with a full skill tree, allowing for you to make her into the most unstoppable force available. Toward the end of the campaign she can be quite unfair because she can take out entire armies by herself, but what would you expect from the most powerful being in the universe? The Leviathan serves as your main command center for the entire game. Each time you fly to a new planet, new units are available for your army making your choices on which planet to fly to critical to your unit build order. When on board the Leviathan several options are available to you, Kerrigan’s abilities and the evolution pit, allowing you to tweak certain things between missions. Among those, conversations are available between Kerrigan and her lieutenants on the ship further explaining the story as you go along. Some of these conversations are completely unnecessary and seemed simply like filler, but others give great insight as to why Kerrigan is as dangerous as ever. Conversations between Kerrigan and the resident swarm queen, Za’gara show how Kerrigan is a great strategist; while conversations with the evolution expert, devoid of emotion creature, Abathur show Kerrigan still has some human characteristics like compassion and mercy. In trying to change up the gameplay slightly from previous Starcraft games, Heart of the Swarm introduces boss fights for certain missions with Kerrigan. The bosses you face are enormous and provide some difficulty if you’re not careful. 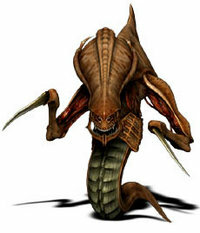 They consisted of attacking and then moving Kerrigan out of the way of an attack, then repeat about 50 times. I think that these were definitely not needed in the game, but they did add a new idea. Perhaps if the battles provided more than just a lot of right clicking to move your character out of the way, they would be more memorable and fun. Some old faces from the Starcraft universe make appearances, and some new characters are introduced, giving more life to the series; although some of the new characters fall flat and I felt were very forgettable. Along with new faces, a few new units are also introduced to the Zerg; first being the Swarm Host, a burrowing unit that continually spawns damage dealing locusts. Second is the Viper, a low damage dealing air unit that has several useful abilities to support your army while, including being able to grab ranged enemy units and bring them to your army for certain death. Useful units in the single player for sure, but they don’t add a ton more depth to the multiplayer aspect. Evolution takes a front seat when it comes to upgrading of the Zerg swarm. 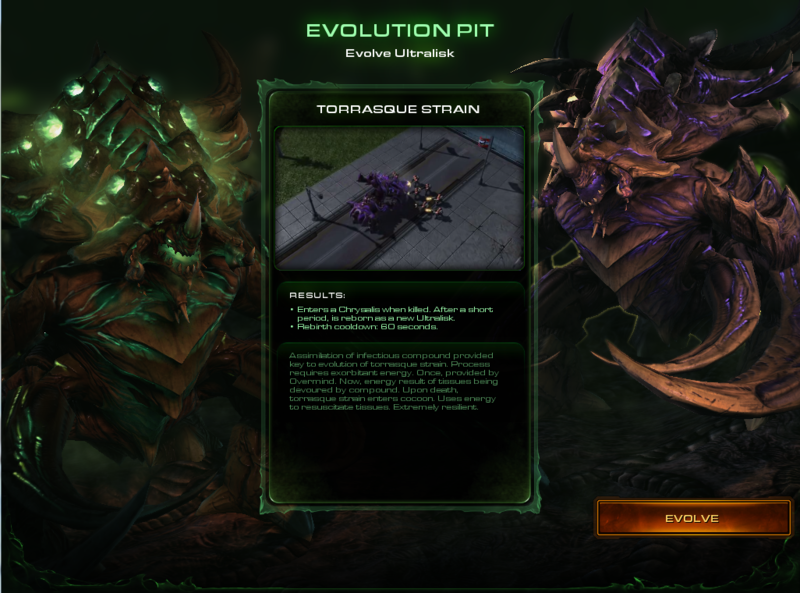 Many of the Zerg units are given an evolution mission, where you are given a task and then are prompted to “evolve” into one of two much more dangerous and useful versions of the basic unit. For example the basic Zergling can evolve in the “Raptor Strain” which can jump up and down cliffs or Ultralisks that will revive after death create for a much more interesting dynamic to the way you can play the single player campaign. Here is where the replayablitily factor comes in, you’re going to want to play through and see how the other evolution option would have fared with your play style. I’m glad they introduced these new evolutions to the campaign because the same old multiplayer units do get tired and drab after a while. I feel that by not including some of the evolutions, in some facet, during the multiplayer Blizzard really missed something special. I understand they don’t want to reinvent the wheel by changing up the multiplayer formula too drastically, but it would sure be interesting being able to use Lurkers in battle again, or Ultralisks that could revive. Blizzard completely revamped the menu system with Heart of the Swarm. This doesn’t sound like a notable difference, but in Wings of Liberty, the main menu options made getting into different game types very convoluted and confusing. The new main menu focuses much more on getting things done quick and dirty. The single player tab allows the player to get into three options. Both the campaigns of Wings of Liberty and Heart of The Swarm are readily available to play along with the sometimes difficult challenge missions. For those of you who are achievement or trophy seekers, the game outlines a whole slew of achievements ranging from win X amount of matches, to produce X amount of units in 5 minutes. These unlock things like new unit skins, gamer portraits, and race decals available for display in the multiplayer section of the game. 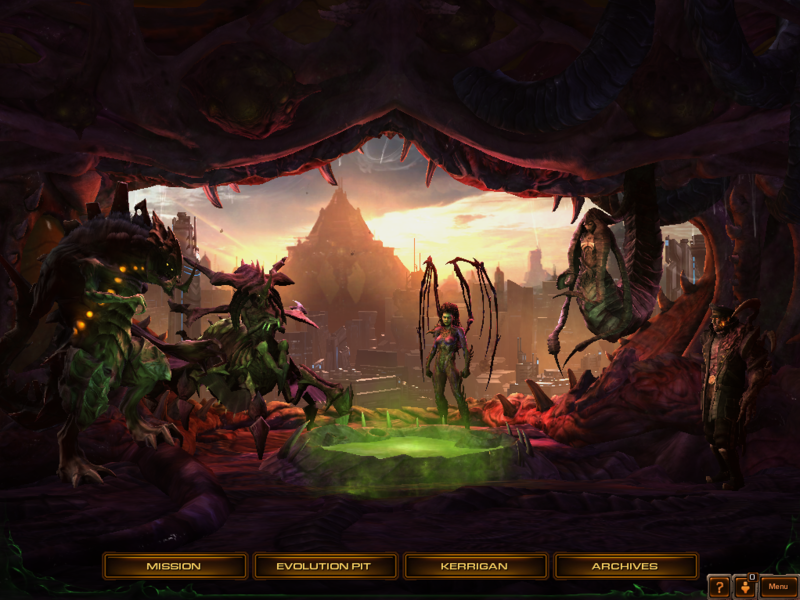 Multiplayer is a huge aspect to the Starcraft name and Heart of the Swarm offers a few different modes to play in. Arcade mode consists of user based games that are great for killing time, but are usually very simple in their design and rely heavily on teammates which can make them incredibly frustrating. The competitive multiplayer consists of 4 different options, Training, Versus A.I., Unranked, and Ranked. Training teaches basic ideas of how to play multiplayer against both humans and A.I. with a series of preset scenarios. Ranked and Versus A.I. matches are ladder based, so every win or loss adds or subtracts to your overall ranking. That makes unranked matches great if you want to work out a build order for a race you may not be good with, or try new strategy without dropping in your ladder ranking. Blizzard made matchmaking much easier to navigate than in Wings of Liberty and updated little things, like being able to play unranked matches, making multiplayer much more enjoyable than before. A few new units have been introduced in the multiplayer for each race and some have been edited from the multiplayer introduced in Wings of Liberty. So far none of these units stand out drastically to me, so using the same strategies from Wings of Liberty’s multiplayer work most of the time with some exceptions. One thing Blizzard does need to work on in terms of Heart of the Swarm multiplayer is the matchmaking. I have played several times in ranked games where I’ve seen a team of bronze level players get matched against diamond level players. There should not be a choice to play against anyone other than your own skill level. A veteran player should not be matched up against a new player in any game. This game in particular makes it quite difficult to win when this happens. Overall, Heart of the Swarm provides a somewhat repetitive story from Blizzard’s other titles and leaves much to be desired in terms of story originality, but the dramatic cut scenes, backed up with a winning formula of gameplay and characters from the Starcraft world creates a memorable gaming experience. With 27 missions and evolution choices, the replay value is there making this more than just a simple add-on. There were several aspects I could have done without but none of them ruined the experience for me. The revamping of the in-game navigation between single player and multiplayer makes it foolproof and so much easier to use. Multiplayer has several new units added to it making for more diversity but not unfair to players. Matchmaking could use a little work, but nothing overly dramatic. Is it the greatest RTS I’ve ever played, probably not; but it fits well into the mythos and frame of a Starcraft game and provides a solid gaming experience. Any fan of the Starcraft series or real time strategy games should go out and buy this game.